A great golf course stands on its own merits, but a colorful, hard-to-forget name never hurts. 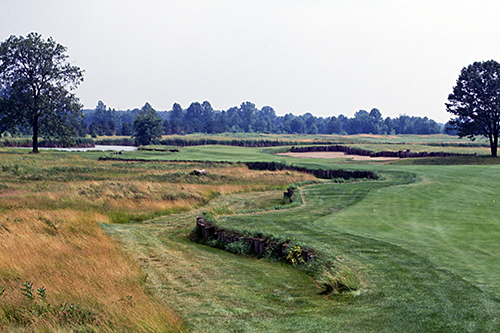 Pete Dye has designed courses which were christened with some of the most memorable names in the game. Among others, there’s Whistling Straits, the Honors Course, Crooked Stick, Firethorn, and perhaps the greatest name in golf-dom: Teeth of the Dog. And sometimes a very simple name will suffice, in golf and beyond. The moniker of an under-the-radar but superb Montana ski hill has been revamped to a snazzier version, but for the first sixty years of the resort’s existence, it was known merely as Big Mountain. One of the most enduring rock groups of the 1960s and 70s was known in straightforward fashion as The Band. 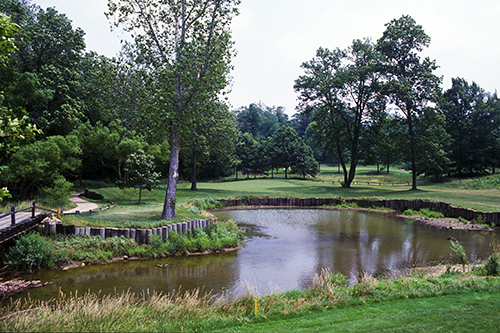 And perhaps Pete Dye’s least-known great golf course, situated on nearly 500 acres of rolling farmland outside Columbus, Ohio is known very simply as The Golf Club. That’s why there are not only no outside tournaments at The Golf Club, but precious few inside tournaments. No club championship, superintendent’s revenge, fall frolic, etc. There’s a two-day member-guest and a one-day member guest. It’s the type of club where, after looking out his office window on a beautiful afternoon for golf, a member can arrive on the bucolic grounds and be assured that course is open, available, and ready for play, virtually every day of the season. The similarities in feel between The Golf Club, and Chattanooga’s Honors Course, which is another top-notch private enclave in the Dye oeuvre, are palpable. Not so much in the era in which they were created (1960s versus 1980s) or in the making (there was very little earth moved at The Golf Club, while Dye practically moved heaven and earth, not to mention a million tons of boulders, to build The Honors in Tennessee). But the clubs are similar in that both are large, beautiful, and unsullied tracts of land. Both offer generous driving corridors that tighten as a player moves towards the green. Perhaps most important, each offers a sense of quietude, a feeling of remove and seclusion that is generally the province of high-end private clubs deep within the confines of the countryside, untarnished by perimeter housing, with modest membership rolls and limited play. It’s a series of combined factors that’s hard to engineer, but when it’s done properly, it affords some of the finest ambience in the game. 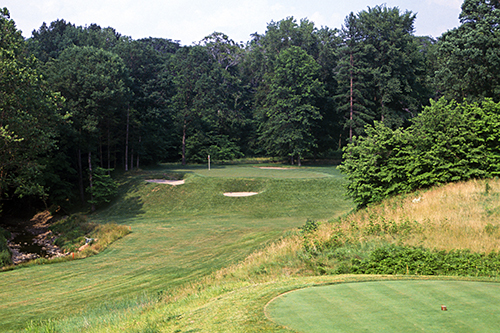 Acres of tall fescue, large bunkers throughout, and the insidious presence of Blacklick Creek on four different holes are the main challenges at The Golf Club. The first two-thirds of the course is predominantly tree-lined corridors, while the final six holes widen out into a series of fields harking back to the farmland roots of the property. The designer considers the design to be “Old English” in style, with a variety of different grasses and fescues combining to offer a rugged Scottish--English appearance. The par-3 third hole showcases the combination of pastoral setting and Dye’s wicked genius that makes the Golf Club such an engaging test of the game. From the tee, it looks like a relatively straightforward shot, albeit one with a forced carry over a fronting pond. But behind the green are a series of five separate bunkers, shored up with railroad ties, the deepest of which is a full eight feet below the green. It’s the last place a golfer wants to be, particularly with the prospect of blasting over the wall, only to have the ball carry into the greenside pond. It’s amazing to consider how avant-garde was Dye’s design at its late-1960s inception. From the get-go, the course was nearly 7,300 yards long. There are a half-dozen par-4s that stretch from nearly 450 yards and well beyond. Two of the four par-5s are just shy of and well over 600 yards in length. Taking into account what is now considered the almost primitive equipment of that bygone era, where neither agronomy nor player conditioning were of the standard set today, the foresight Dye showed is remarkable. Simply put, in more than fifty years of existence, the course hasn’t been lengthened appreciably. One bit of trivia in conclusion. At the turn, many players opt for a bag of beef jerky that is made fresh regularly by the club’s longtime chef. A few bites, and one’s affinity for packaged, store-bought jerky will wane. This signature snack is distinctive, of enduring quality, and hard to forget. Just like a round at The Golf Club itself.